Heavy duty steel case construction. 2 modes: random and automatic mode for a pre-determined length. In automatic mode. feeds and cuts the next piece of tape as the previous one is removed. Exclusive safety shield for operator protection. 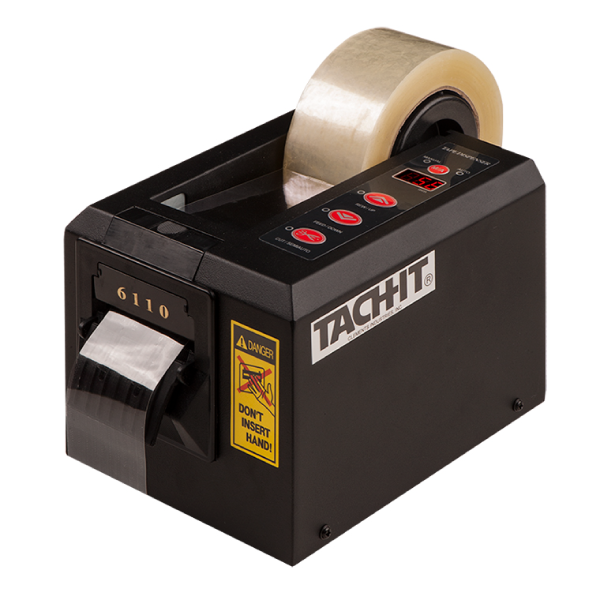 Works with 1 roll for tape up to 2 inches wide or 2 rolls of tape up to 1 inch wide each. 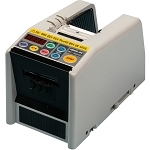 Can cut most types of tapes including carton sealing, packaging, filament, acetate, masking, flat back and many others. Guillotine cut for smooth edge to the tape. Easy to read LED and push button controls for length adjustment and mode selection. Length adjustment is in millimeter increments. 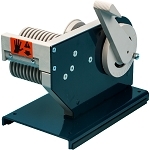 Adjustable pressure roller for different thicknesses of tapes for positive feeding. 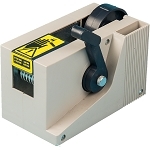 This automatic feed and cut definite length tape dispenser can work with 1 roll of tape up to 2 inch wide or 2 rolls of tape up to 1 inch wide each. 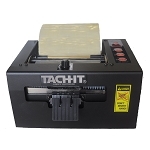 Heavy duty steel case construction, reliable and easy to use with push button and LED controls, the Tach-It Model 6110 can cut most types of pressure sensitive tape from 3/4 inch to 39.3 inches in length. 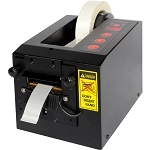 In automatic setting, the model #6110 will feed the next piece of tape as soon as the previous length has been removed. Simply holding the feed button will allow for random lengths of tape to be fed. 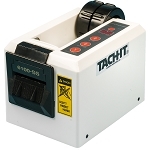 Small bench top design, exclusive safety shield to protect the operator, and adjustable tape pressure to ensure positive tape feeding are all advantages of this machine.